If you’ve ever made pumpkin cookies (like these Cinnamon Glazed Pumpkin Cookies, perhaps?) you know they’re usually cakey, like a muffin. Cakey and delicious. But this time I had something else in mind. I wanted chewy pumpkin cookies. Once I get an idea in my head, there’s no letting it go. Molasses cookies are my favorite chewy cookies. Obviously they could only get better if I added pumpkin! So this past weekend I made 60+ cookies and spent several hours trying out recipes to get chewy pumpkin cookies. In the end, the recipe I came up with was only kinda chewy (-ish). It’s hard to make non-cakey pumpkin cookies! I’d like to revisit the idea sometime to see if I can make them even chewier, but I’m sharing this recipe now because even if they were still a little cakey, these cookies were irresistible. They’re packed with fall flavors and spice, plus a little crunch from the sugar coating. My friends and I polished off nearly all of them in one weekend. Even my dog, who was refusing to eat over the weekend, ate a few cookie pieces. They’re that good. There is one somewhat time consuming step to these cookies – dehydrating the pumpkin – but it’s essential for the chewy (-ish) texture. These cookies have the best flavor and texture a day or two AFTER you bake them, so they’re ideal for baking ahead. They barely spread in the oven. To get the chewiest cookie, flatten the dough balls and underbake them a little. For a cakier, poofier (and still addictive) cookie, don’t flatten the dough balls and let them bake a little longer. Preheat oven to 375°F. Line two baking sheets with Silpats or parchment paper. In a medium bowl, whisk together flour, baking soda, salt and spice. In a saucepan or a microwave safe bowl, melt 11 Tablespoons of butter. Combine melted butter with remaining butter in a large bowl. Add sugars and whisk to combine. Add pumpkin and molasses, whisk again. Whisk in egg yolk and vanilla. Using a spatula, fold flour mixture into wet ingredients just until a dough forms and all flour is incorporated. In a small bowl, whisk together 1/4 cup granulated sugar, 1/4 cup raw sugar and 1/2 teaspoon ground cinnamon. Roll dough into balls, 1-2 tablespoons in size. Roll each dough ball in the small bowl of sugar until coated and set on baking sheets, 8 to 12 cookies to a sheet. For the chewiest cookies, completely flatten dough balls with the bottom of a glass or measuring cup and bake for just 7-8 minutes, until edges are set but centers still look a little wet. Cool on the baking sheet for 5 minutes, then place on a wire rack to cool completely. For cakier cookies, bake round dough balls for 10-13 minutes, until edges are slightly browned and cookies are set. Cool on a wire rack. Store covered at room temperature. Best served 1-2 days after they’re baked. Removing the water from pumpkin puree helps yield a chewier cookie. It couldn’t be easier, but it is a little time consuming. You’ll only need about half of this recipe to make a batch of cookies. Dump pumpkin puree into a medium saucepan or saute pan over medium heat. Cook, stirring frequently and spreading out pumpkin with a spatula, for 50 minutes to 1 hour or most of the water has cooked out. Pumpkin should darken in color and be the consistency of clay or a stiff cookie dough. Cool to room temperature or refrigerate overnight. I LOVE molasses cookies, so a pumpkin version sounds wonderful! As long as they taste good I wouldn’t mind if the texture is a little too cakey. I’ve had the same issues with pumpkin as you. I tried to make pumpkin shortbread last year and it was just too soft instead of being crispy like shortbread is supposed to be. I haven’t heard of this method to dehydrate pumpkin, though, so I’m wondering if that would help. Thanks for the tip! What a smart idea…dehydrating pumpkin. I love molasses cookies and anything pumpkin. These sound perfectly delicious! Ooh yum! I’ve been looking for a pumpkin cookie. I love the flavors in this – will have to give it a try. These sound like the epitome of autumn. Love your take on a chewy pumpkin cookie – I LOVE chewy cookies! I need to learn from you! exclamation mark! This recipe looks a lot like the recipe for Molasses Crinkles from the Mennonite Community Cookbook, except with the addition of pumpkin, which I have 4 butternut squash looking at me begging and pleading to be made into something. I will surely experiment and try using one of them to make these cookies. Seriously. deja vu going on here. weird. 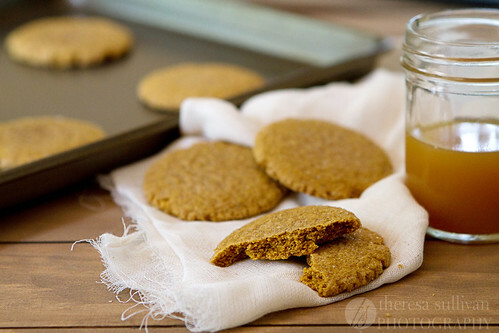 try pumpkin butter… your fellow blogger too tried to find chew pumpkin cookies! hth!